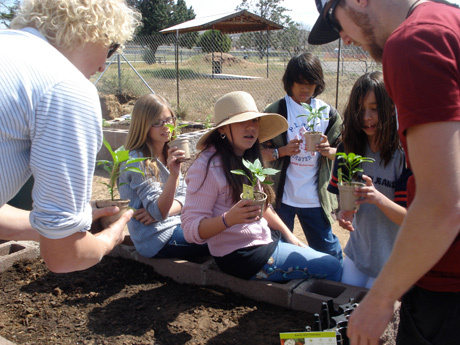 There are great organizations planting gardens in urban schools -- Alice Waters' Edible Schoolyard is the most famous example -- but we asked a young middle school teacher about a grass-roots effort planting one in rural Arizona, inspired by the book "Seedfolks." This is her report. There is something about 6th graders and dirt that just makes sense. They can't resist it; can't wait to move it and pile it and throw it in each other's faces. But when you're a 6th grader in the desert, "outside" is a different kind of beast. As I watched my students in rural Arizona pull cactus needles out of their rear ends and kick up dust, I thought about the uses of this barren land we call home -- and we don't use much. Moving from a big Michigan city to this tiny Arizona town called Camp Verde, I found that the word "barren" could be used to describe almost everything -- the landscape, the bookshelves that lined my English classroom, the extreme apathy for education and the rare semblances of togetherness between the Hispanic, Native, white and black students. At school board meetings, all I heard was "We need to form a sense of community," and "Our community needs a stronger identity." Camp Verde is a dot on a map -- but what is it? I tried to figure this question out with my 6th graders. We made lists of things our community is and isn't, what it needs and doesn't. The one thing that reappeared, over and over, was food. From the tamales that Hispanic students share with each other to the local fry bread stand a Native American family runs, the unique things we eat were the dominant traits that defined us. We talked about how important, culturally and practically, food is to family and we talked about how being poor means having few resources for fresh produce. So, with community and food swirling in my head, my students and I planted a garden. We dug up the weeds, trekked manure from neighbors' farms, and $40 later, planted a plethora of local plants outside of our three-school, K-12 complex. As we measured distances and plopped seeds into the prepared earth, the squeals of excitement at the sight of a slug or the misfire of the garden hose triggered a smile on my face that had not been so fierce in some time. We researched the plants, planned for their use in the cafeteria, created a classroom-composting bin, and most important, talked about the compelling diversity of the place we lived. The day we planted, I saw something I had not seen in Camp Verde, ever: Parents, who rarely seemed invested in their childrens' education, showed up with rakes and trowels. A college professor called and asked if he could help. A woman who ran a greenhouse donated bags of compost on the spot. The community began flocking to the garden site. I asked one student what she was learning and she replied, "Nature is more than what God created. It is a part of life." I was stunned. The Native American parents that showed up began impromptu lessons about the history of the agave plants, and another 6th grade teacher taught a lesson about water conservation in the desert. Inside the garden, inside the decrepit fence, racial tensions eroded and the true meaning of community blossomed. It was likewise inside the classroom. When one student, Sharli, talked about the chilies her family grows on their farm, a Hispanic student look stunned and said, "Really? You eat chilies?" The connections and compassion came from all over, reappearing daily. At the end of the unit, students brought in dishes from their cultures and we learned about every family and what is "normal" for them to eat for dinner. Students found similarities and loved the differences. When I admitted that I had never been introduced to tamales before, students loved sharing them with me. It was a binding experience that paved the way for new friendships and discussions. We sat in our garden, weeks later, and all wrote about the growth we could taste and touch with our fingertips. Students talked about how they wanted to keep this going forever. With impending budget cuts, teachers working with half the lights on, and another year of ancient textbooks, the funding to put in a functional (and environmentally friendly) watering system was just not plausible. But we keep plugging. We keep toiling in our small piece of desert land where things still grow. My dream as an educator is to give our community what we deserve -- the right of healthy, local, community-driven food. While we've created something that students will hopefully remember and cherish, we still have much more work to do. We have funds to raise. We have people to convince. But, when the school board asks me, "What can we do to create community?" I'll tell them the answer: food.